The hispid hare (Caprolagus hispidus), also called Assam rabbit, is a leporid native to South Asia, whose historic range extended along the southern foothills of the Himalayas. Today, the habitat of the hispid hare is highly fragmented with an area of occupancy of less than 500 km2 (190 sq mi) extending over an estimated area of 5,000 to 20,000 km2 (1,900 to 7,700 sq mi). Populations experience a continuing decline in suitable habitat due to increasing agriculture, flood control, and human development. It is therefore listed as Endangered on the IUCN Red List since 1986. The hispid hare has a harsh and bristly coat. The ears are very short and do not project beyond the fur. The coat is dark brown on the back due to a mixture of black and brown hairs; brown on the chest and whitish on the abdomen. The tail is brown and about 30 mm (1.2 in) long. In body weight males range from 1,810 to 2,610 g (3.99 to 5.75 lb) with a mean of 2,248 g (4.956 lb). Females weigh in average 2,518 g (5.551 lb), including a heavily pregnant female weighing 3,210 g (7.08 lb) in this statistical mean weight. 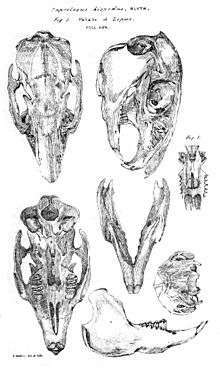 The frontal bones are very wide. The occipito-nasal length generally exceeds 85 mm (3.3 in). There is no clear notch in front of postorbital processes. In average, this hare is 476 mm (18.7 in) long from head to tail. 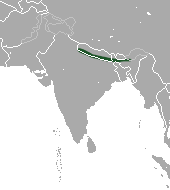 The historic range of hispid hares extended from Uttar Pradesh through southern Nepal, the northern region of West Bengal to Assam and into Bangladesh. Today, distribution is sporadic in Bangladesh, India, Nepal and possibly Bhutan. They occupy tracts of early successional tall grasslands and take refuge in marshy areas or grasses adjacent to river banks during the dry season, when these areas are susceptible to burning. The population in the extensive grasslands of Sukla Phanta Wildlife Reserve may be of international significance. Researchers camera trapped the first hispid hares in an area of 38 km2 (15 sq mi) in the reserve in April 2010. Hispid hares are most active at dawn and dusk. The limited information available on reproduction indicates that their average litter size is small. 1 2 Maheswaran, G.; Smith, A. T. (2008). "Caprolagus hispidus". IUCN Red List of Threatened Species. Version 2016.2. International Union for Conservation of Nature. ↑ Hoffman, R.S. ; Smith, A.T. (2005). "Order Lagomorpha". In Wilson, D.E. ; Reeder, D.M. Mammal Species of the World: A Taxonomic and Geographic Reference (3rd ed.). Johns Hopkins University Press. pp. 194–195. ISBN 978-0-8018-8221-0. OCLC 62265494. ↑ Blyth, E. (1845). "Description of Caprolagus, a new genus of leporine Mammalia". Journal of Asiatic Society of Bengal. 14: 247–249. ↑ Pearson, J. T. (October 22, 1839). "18. Lepus hispidus". Proceedings of the Zoological Society of London. VII: 152. 1 2 3 Bell, D. J.; Oliver, W. L. R.; Ghose, R. K. (1990). "Chapter 9: The Hispid Hare Caprolagus Hispidus". In Chapman, J. A.; Flux, J. E. C. Rabbits, Hares, and Pikas: Status Survey and Conservation Action Plan. Gland, Switzerland: International Union for Conservation of Nature and Natural Resources. pp. 128–137. ISBN 2831700191. ↑ Ellerman, J. R.; Morrison-Scott, T. C. S. (1966). Checklist of Palaearctic and Indian mammals 1758 to 1946 (2nd ed.). London: British Museum of Natural History. p. 424. ↑ Macdonald, D. W. (2009). The Encyclopedia of Mammals. Oxford University Press. ISBN 0-19-956799-9. ↑ Baral, H.S. ; Inskipp, C. (2009). "The Birds of Sukla Phanta Wildlife Reserve, Nepal". Our Nature. 7: 56–81. doi:10.3126/on.v7i1.2554. ↑ Aryal, A.; Yadav, H. K. (2010). "First Cameras Trap Sighting of Critically Endangered Hispid Hare (Caprolagus hispidus) in Shuklaphanta Wildlife Reserve – Nepal" (PDF). World Applied Sciences Journal. 9 (4): 367–371.